Great looking rugged all weather design for the outdoor enthusiast Recharagable Li-Poly battery >950 lumins for 3 hr 600 lumins 8 hr >IP68 >dust proof, 2 m water proof >battery indicator >3 mode tail cap switch This item cannot ship to APO/FPO addresses. Please accept our apologies. 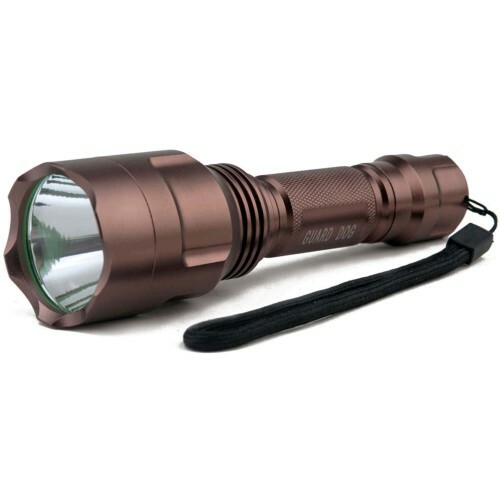 This Dual-Light Flashlight uses a CREE LED rated at 300 lumens paired with a high-efficiency deep parabolic reflector, creating a flashlight beam with an effective range of 201 meters. Additionally, built into the handle is a 200 lumen floodlight. Unlike the flashlight beam, the light coming out of the floodlight does not have a reflector so the light spreads out in a wide, even, unfocused pattern of light...perfect for lighting up things that are close. Additionally, both the flashlight and the floodlight can be turned on at the same time for even more versatile lighting options. The waterproof design, in combination with a PC/ABS chemical, heat and impact resistant housing, make this product a great value. Additionally, the integrated magnets located in the base of the handle and the pocket clip, provide for almost limitless hands-free usage. Powered by 3 AA batteries (included). The Guard Dog Orion shines a 400 lumen wide-radius beam, capable being seen as far as the naked eye can travel. By pressing the glow in the dark tail switch, the Orion quickly changes to five functions; ultra bright, high, low, self defense strobe and emergency S.O.S. Drop it or drown it, the Guard Dog Orion is built with a unique brushed copper finish in an aircraft grade body, ideal for any condition. The glow in the dark tail cap and head allow for easy access and location in dark areas. The OrionG++s rigid front bezel also acts as a glass breaker and self defense device in the event of an emergency. To boast its efficiency and usability, the Guard Dog Orion comes with a rechargeable battery and battery charging cradle. The blinding 400 lumen flashlight is equipped with up to a 100,000 bulb life in the enhanced aluminum reflector system.The Guard Dog Orion is endured to be a go-to light for every household and enthusiast. 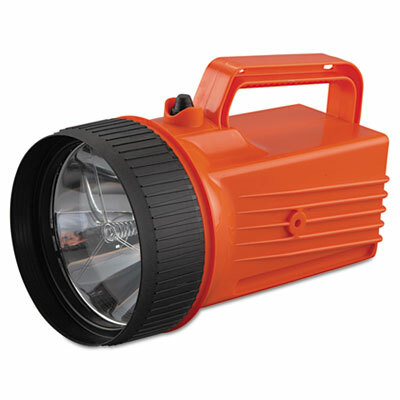 Waterproof safety lantern provides bright, clear light in hazardous situations. Floating lantern won't sink and can be retrieved easily in wet surroundings. Built-in switch guard offers impact protection. Oversized reflector and unbreakable Tuflexx� lens provide maximum lighting. Spare bulb compartment ensures you're never left in the dark. Glove-sized handles for an easy grip. Battery Type: Alkaline; Flashlights Type: Lantern; Power Source(s): 6V; Bulb Type: Krypton. 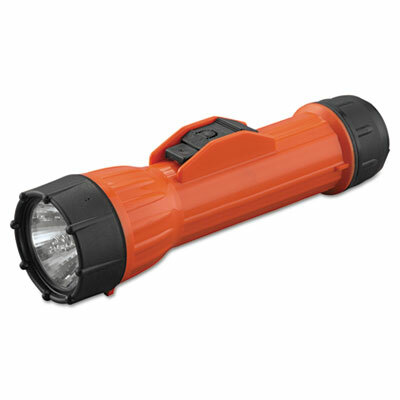 Rugged, waterproof, anti-roll flashlight stands up to the most challenging work environments. Oversized, faceted reflector maximizes light output. Unbreakable Tuflexx� lens provides nearly unparalleled bulb protection. Three-way switch with On-Off-Flash settings enables spot and signaling versatility. Circuit-break mechanism automatically cuts current in the unlikely event of moisture contamination. 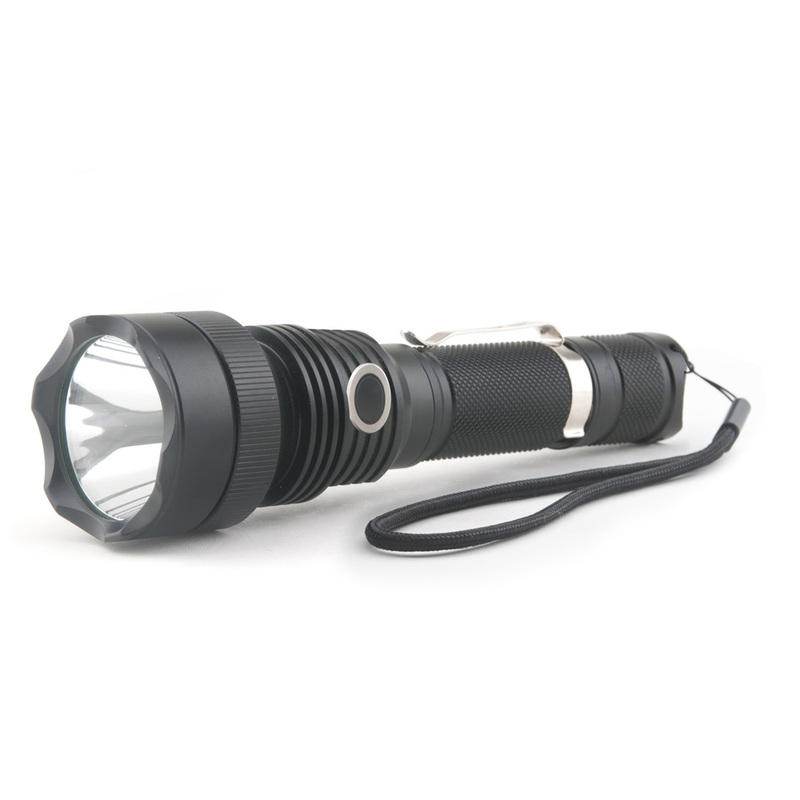 Polypropylene lens ring accommodates Bright Star� snap-in signaling wands (sold separately). 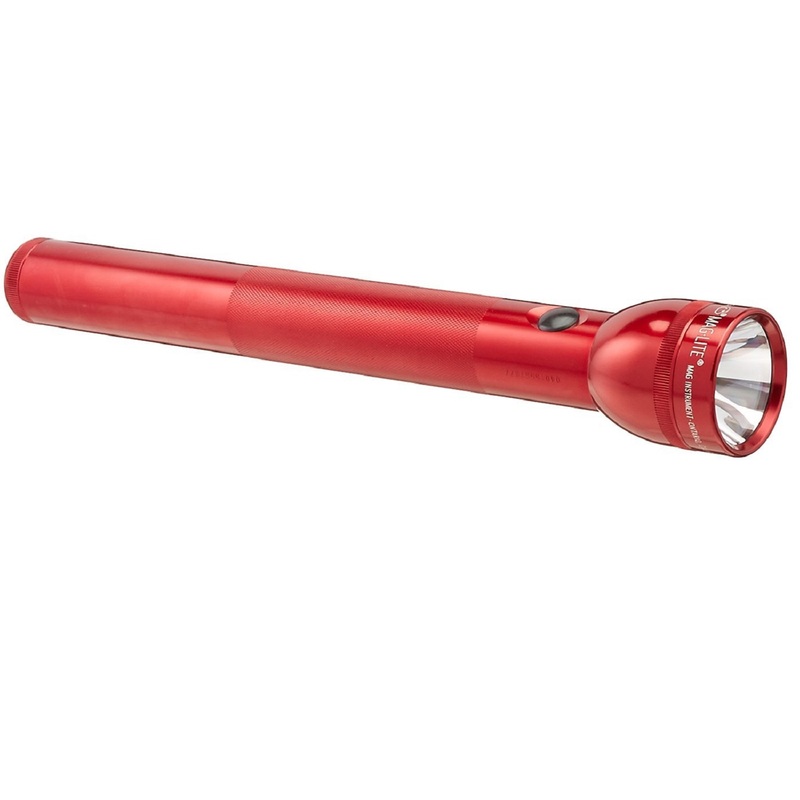 Battery Type: Alkaline; Carbon-Zinc; Flashlights Type: Standard; Power Source(s): 2 D; Bulb Type: PR-2. The Guard Dog Xcess tactical flashlight provides a truly customizable light output in a gleaming 550 lumen tactical flashlight. On its brightest mode, the Xcess 550 lumen flashlight can be seen as a spotlight at least 200 yards away. Switch to a low, energy consumption mode at 100 lumens and utilize nearly 10 hours of battery life. Need a customized output? The Guard Dog Xcess incorporates a unique user control button located conveniently at a natural grip position which allows you to tailor your light power between ultra bright and low beam levels, as well as switch to an emergency strobe function. Reset back to the ultra bright position at any time by pressing the tail switch, which also doubles as a discharge button to prevent accidental activation and unnecessary battery drainage. Need just one light function without cycling through different modes? Depress the tail switch to go from off to ultra bright and back to off. The durable Guard Dog Xcess is o-ring sealed for waterproof and all weather resistant capabilities. Built with type III aluminum alloy, the flashlight can withstand the most brutal conditions, yet easily clip on with its included belt clip. In the event of an emergency escape, the fierce bezel transforms into a glass shattering companion. A light built for professionals, by professionals yet designed for your everyday use, the Guard Dog Xcess will exceed your every expectation. Guard Dog Security introduces its widest and brightest beam in the Solaire 900 lumen tactical flashlight. 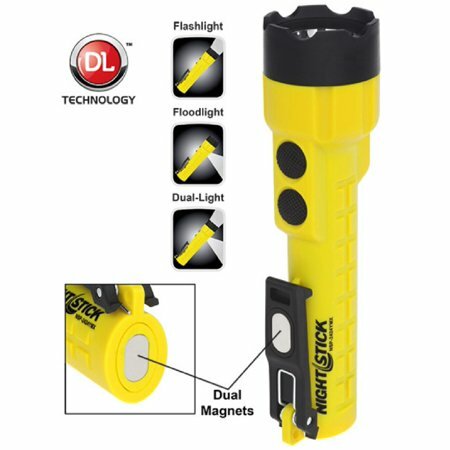 This blinding flashlight shines a beam spanning up to 20 yards wide and capable of fully illuminating an enclosed area further than 2 football fields away! The one-hand operational tail push button ensures a quick release and swift change between all five light functions. 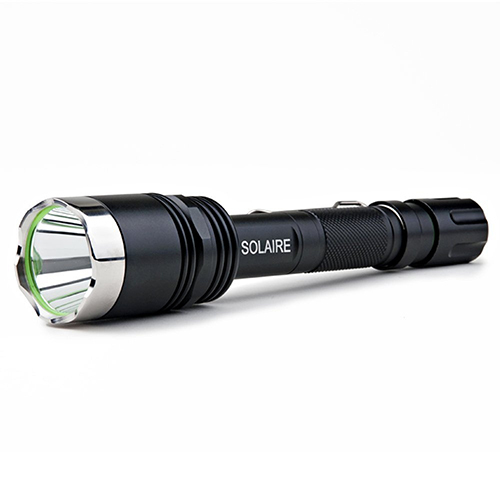 Powered by a high-powered CREE bulb, the Solaire encompasses a stainless steel bezel for emergency glass breaking/self defense and suited in type III aircraft grade aluminum for ultimate durability in any terrain. Drop it or drown it, the Guard Dog Solaire is the premium in tactical flashlights with a complete waterproof body and anti-roll shaft. The unique, night glow green o-rings enable the light to be located in complete darkness. Dual lithium-ion battery charger allows for fast charging in any wall outlet. 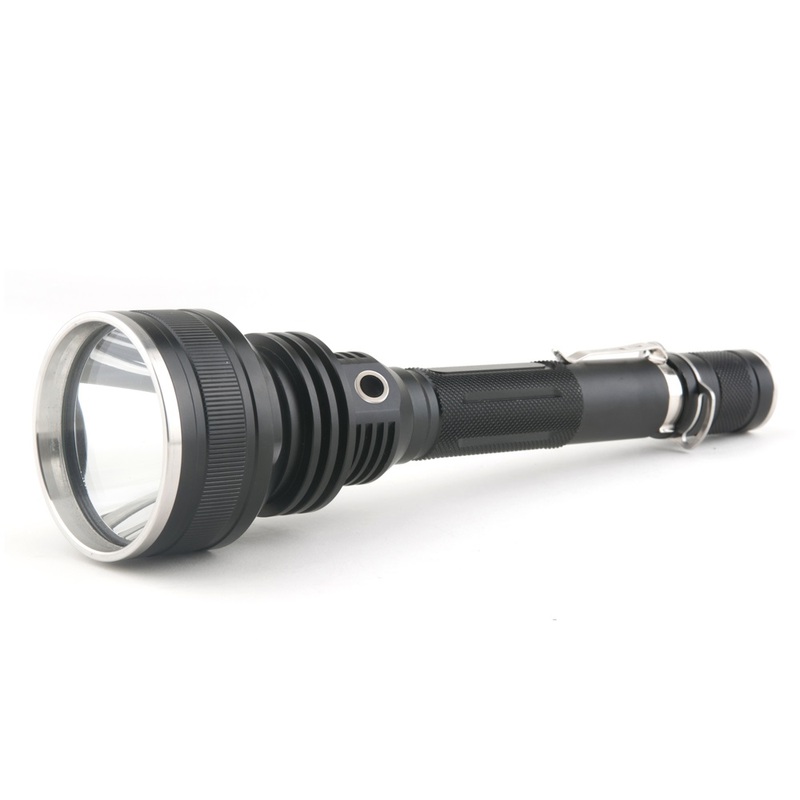 The Guard Dog Solaire tactical flashlight boasts the brightest, widest and most durably constructed tactical flashlight on the market, while serving plentiful as an everyday flashlight. Features: Power: 900 lumens Battery: 100% rechargeable; Includes 2 lithium-ion batteries and dual wall plug-in battery charger cradle; Light Functions: 5-light functions; Ultra bright: 900 lumens; High: 450 lumens; Low: 30 lumens; Strobe: 900 lumens; S.O.S. : 900 lumens. 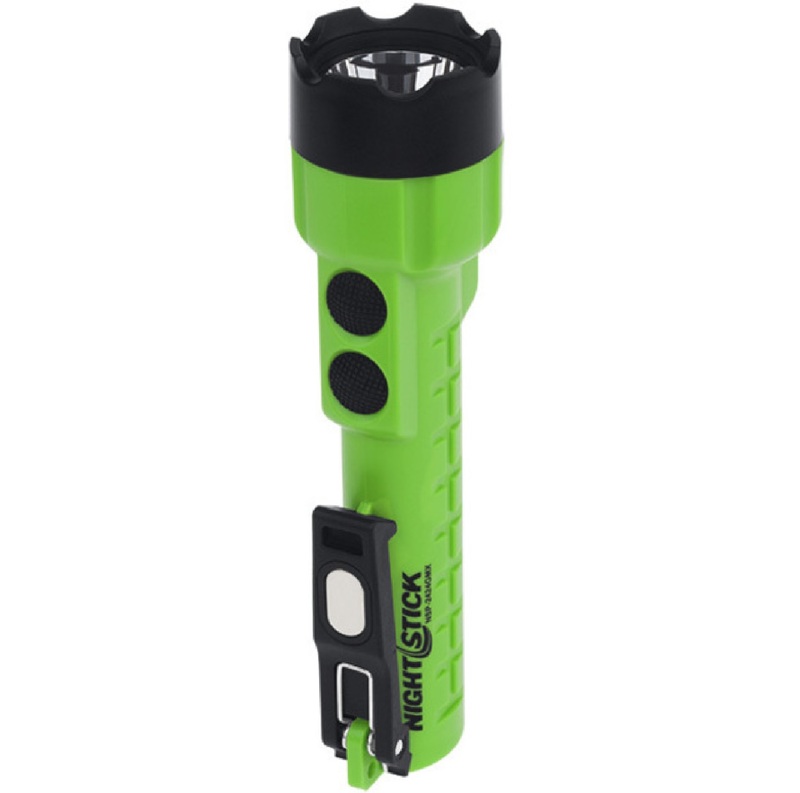 Performance: Waterproof, all weather resistant, shock proof durable body Bulb life: Up to 100,000 hour bulb life, enhanced aluminum reflector system Night Glow Technology: Unique night-glow green o-ring technology allows the flashlight to be located in complete darkness. Stainless Steel Bezel: Stainless steel, glass breaker/self defense end bezel and stainless steel belt clip. Model: TL-GDS900. 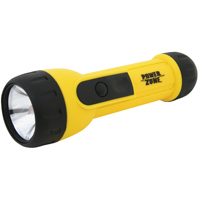 Compact, waterproof, non-conductive polymer flashlight. Features tailcap on-off switching and Xenon bulb. Uses 4 AA alkaline batteries.